It’s hard to overstate the importance of understanding the difference between shifts in curves and movements along curves. Remember, when we talk about changes in demand or supply, we do not mean the same thing as changes in quantity demanded or quantity supplied. Figure 1. Change in Demand. A change in demand means that the entire demand curve shifts either left or right. The initial demand curve D0 shifts to become either D1 or D2. This could be caused by a shift in tastes, changes in population, changes in income, prices of substitute or complement goods, or changes future expectations. Figure 2. Change in Quantity Demanded. 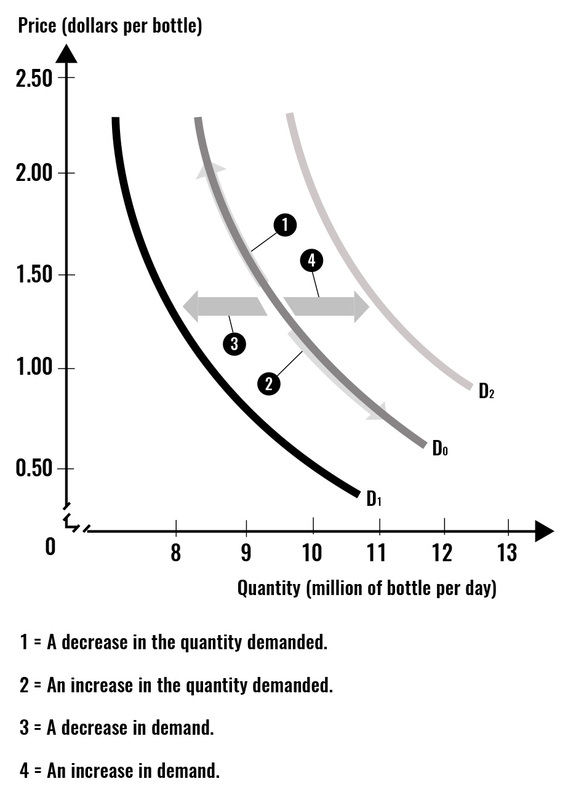 A change in the quantity demanded refers to movement along the existing demand curve, D0. This is a change in price, which is caused by a shift in the supply curve. Figure 3. Change in Supply. A change in supply means that the entire supply curve shifts either left or right. The initial supply curve S0 shifts to become either S1 or S2. This is caused by production conditions, changes in input prices, advances in technology, or changes in taxes or regulations. Figure 4. Change in Quantity Supplied. A change in the quantity supplied refers to movement along the existing supply curve, S0. This is a change in price, caused by a shift in the demand curve. Here’s one way to remember: a movement along a demand curve, resulting in a change in quantity demanded, is always caused by a shift in the supply curve. Similarly, a movement along a supply curve, resulting in a change in quantity supplied, is always caused by a shift in the demand curve. Watch this video for another demonstration of the important distinction between these terms. Try graphing each of these situations to determine if they cause a shift in demand, quantity demanded, supply, or quantity supplied.